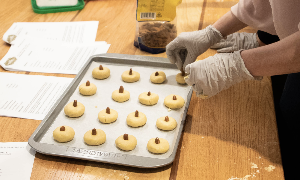 The aroma of Turkish cooking — savory spanakopita, pungent Turkish coffee and honeyed baklava — drifted through Shepherd Hall in early December, as 14 Northwestern students literally prepared to feast on the subject of their first-year seminar. Under the tutelage of Turkish chefs from the Chicago restaurant Café Corbel, they spooned mounds of rice and vegetables into large boiled grape leaves and tucked them into eggroll-shaped servings of dolma. Others sliced paper-thin sheets of dough into small squares, upon which they placed tiny spheres of seasoned meat. They then pinched the dough into the miniature pyramids that Turkish diners recognize as manti. One student followed the Turkish custom of loading a soup spoon with 40 manti, which brides are told will lead to a successful marriage. “I’m marrying myself!” the student exclaimed, as the room erupted in laughter. The feast in the dorm’s ground-floor demo kitchen was the culmination of the first-year seminar “We Are What We Eat: Turkish Food Culture And Cuisine.” Created and taught by Oya Topçuoğlu, a lecturer in Weinberg College’s Middle East and North African Studies program, the course explores a variety of topics — immigration, religion, identity, politics, history — through the lens of food. Through discussions, readings, films, guest lectures, and events like the end-of-the-quarter feast, Topçuoğlu used food, and the rituals surrounding cooking and eating, as a starting point to frame larger issues. How does food reflect personal and national identity? How do practices around food reveal regional, ethnic and religious differences? And can a dessert like baklava really start and end a political conflict? An entire week was devoted to the subject of coffee, which has a long and storied presence in Turkish culture. Students studied the history of Turkish coffee houses, which were traditionally social spaces devoted to the lively discussion of culture and politics, and observed the differences to American coffeeshops of today, where patrons tend to work quietly before the glow of laptop computers. In fact, cross-cultural comparison was a central theme of the class. After covering Turkey’s basic history, geography, and climate, students analyzed Turkish cuisine and food culture outside of Turkey. Even in its native land, Turkish food is an amalgamation of influences from diverse immigrant and minority populations. The cuisine continues to evolve as Turks who emigrate adapt their foods to the tastes of diners in other cultures. The students learned more about this process of evolution when they spoke with the owners of the Chicago restaurant Gundis Kurdish Kitchen, who explained how they modify their menu items to appeal to local tastes. The seminar even veered into the role Turkish food played in the imagination of C.S. Lewis, who gave the dessert “Turkish delight” a prominent role in his series The Chronicles of Narnia. The sugar-packed dessert was a favorite craving of the author during World War II, when sugar was severely rationed in the United Kingdom. “He was conjuring the sweetest, most inaccessible food he could imagine,” Topçuoğlu said. The course challenged Topçuoğlu, who was born and raised in Turkey, to think about food in the broadest way possible. “The goal was to cover a wide variety of topics, and not just talk about kebabs and baklava,” she said. That being said, she did fly baklava in from Turkey especially for the class. An overnight flight brought the dough to a Turkish shop in New York, where it was baked and flown to Chicago —and hand-delivered by MENA’s program assistant in the middle of class. This article has been produced in collaboration with the Office of International Relations.